In an H.264/AVC codec, macroblock data are transformed and quantized prior to coding and rescaled and inverse transformed prior to reconstruction and display (Figure 1). Several transforms are specified in the H.264 standard: a 4x4 “core” transform, 4x4 and 2x2 Hadamard transforms and an 8x8 transform (High profiles only). This paper describes a derivation of the forward and inverse transform and quantization processes applied to 4x4 blocks of luma and chroma samples in an H.264 codec. The transform is a scaled approximation to a 4x4 Discrete Cosine Transform that can be computed using simple integer arithmetic. A normalisation step is incorporated into forward and inverse quantization operations. The inverse transform and re-scaling processes, shown in Figure 2, are defined in the H.264/AVC standard. Input data (quantized transform coeﬃcients) are re-scaled (a combination of inverse quantization and normalisation, see later). The re-scaled values are transformed using a “core” inverse transform. 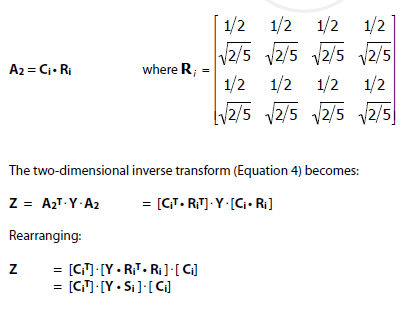 In certain cases, an inverse transform is applied to the DC coeﬃcients prior to re-scaling. These processes (or their equivalents) must be implemented in every H.264-compliant decoder. 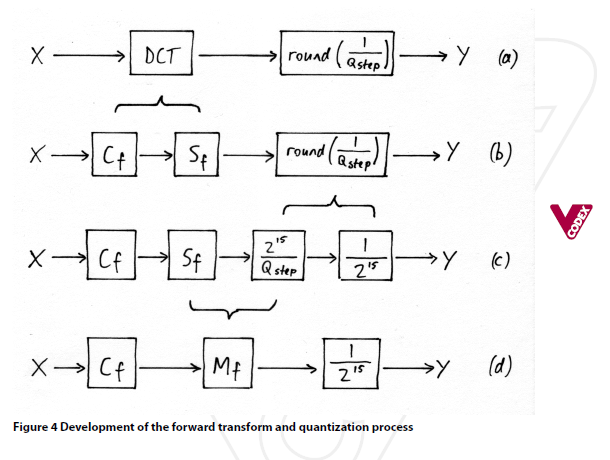 The corresponding forward transform and quantization processes are not standardized but suitable processes can be derived from the inverse transform / rescaling processes (Figure 3). 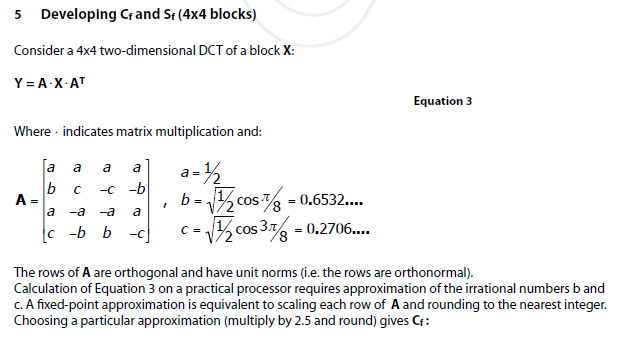 The basic 4x4 transform used in H.264 is a scaled approximate Discrete Cosine Transform (DCT). The transform and quantization processes are structured such that computational complexity is minimized. This is achieved by reorganising the processes into a core part and a scaling part. Consider a block of pixel data that is processed by a two-dimensional Discrete Cosine Transform (DCT) followed by quantization (dividing by a quantization step size, Qstep , then rounding the result) (Figure 4a). 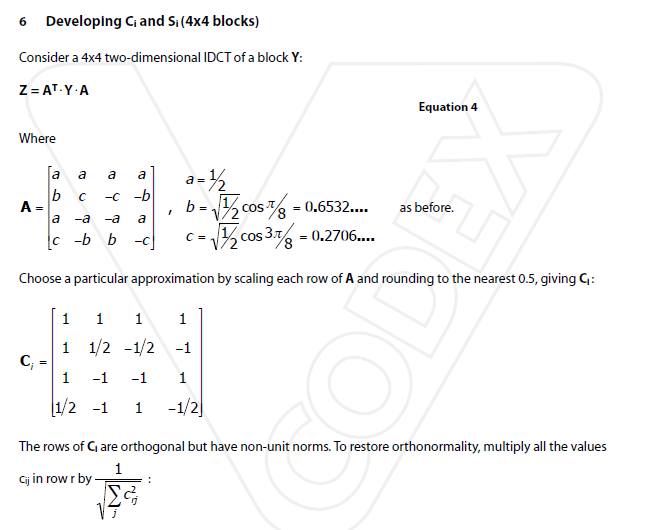 Rearrange the DCT process into a core transform (Cf) and a scaling matrix (Sf) (Figure 4b). Scale the quantization process by a constant (215) and compensate by dividing and rounding the final result (Figure 4c). 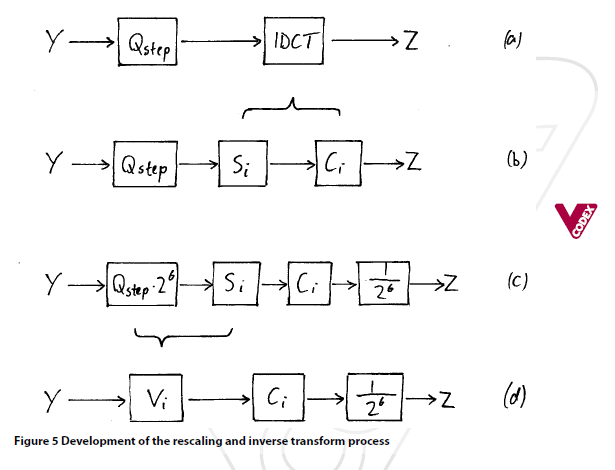 Consider a re-scaling (or “inverse quantization”) operation followed by a two-dimensional inverse DCT (IDCT) (Figure 5a). Rearrange the IDCT process into a core transform (Ci) and a scaling matrix (Si) (Figure 5b). 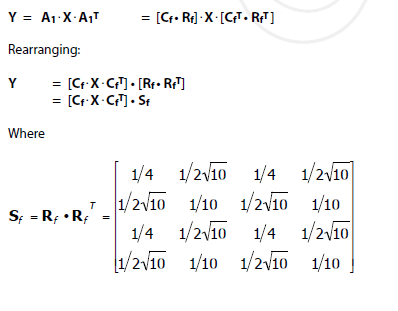 Scale the re-scaling process by a constant (26) and compensate by dividing and rounding the final result (Figure 5c). This approximation is chosen to minimise the complexity of implementing the transform (multiplication by Cf requires only additions and binary shifts) whilst maintaining good compression performance. 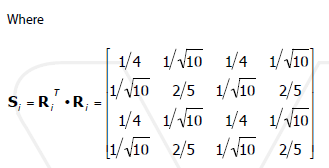 denotes element-by-element multiplication (Hadamard-Schur product). Note that the new matrix A1 is orthonormal.  The core inverse transform Ci and the rescaling matrix Vi are defined in the H.264 standard. Hence we now develop Vi and will then derive Mf . H.264 supports a range of quantization step sizes Qstep . The precise step sizes are not defined in the standard, rather the scaling matrix Vi is specified. Qstep values corresponding to the entries in Vi are shown in the following Table. 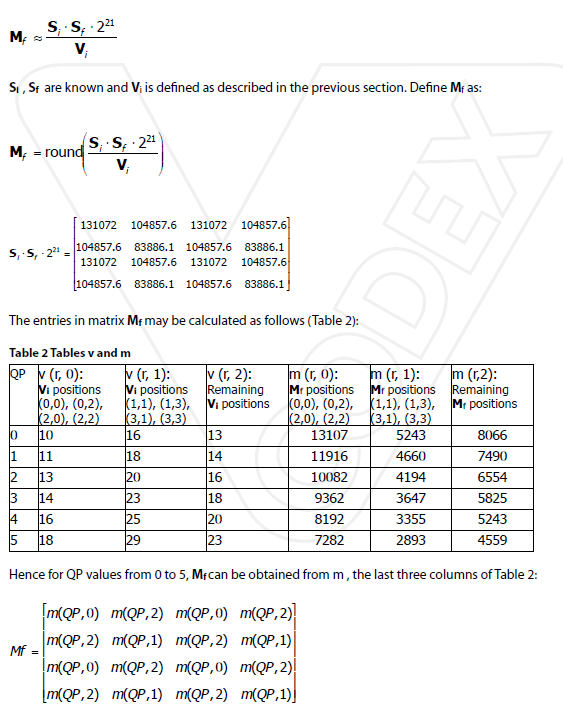 The values in the matrix Vi depend on Qstep (hence QP) and on the scaling factor matrix Si . 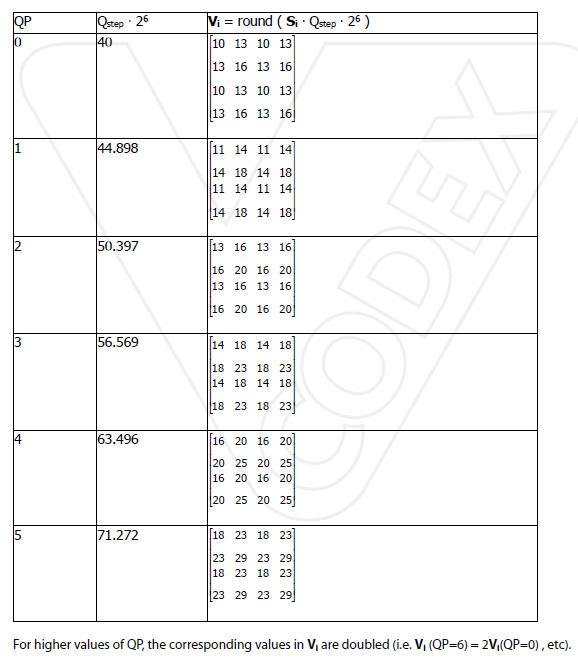 These are shown for QP 0 to 5 in the following Table. Where v (r,n) is row r, column n of v.
(Note: rounded division by 26 can be carried out by adding an oﬀset and right-shifting by 6 bit positions). Where m (r,n) is row r, column n of m.
(Note: rounded division by 215 may be carried out by adding an oﬀset and right-shifting by 15 bit positions). ITU-T Recommendation H.264, Advanced Video Coding for Generic Audio-Visual Services, November 2007. Malvar, A. Hallapuro, M. Karczewicz, and L. Kerofsky, Low-complexity transform and quantization in H. 264/AVC, IEEE Transactions on Circuits and Systems for Video Technology, vol. 13, pp. 598–603, July 2003. Wiegand, G.J. Sullivan, G. Bjontegaard, A. Luthra, Overview of the H.264/AVC video coding standard, IEEE Transactions on Circuits and Systems for Video Technology, vol. 13, No. 7. (2003), pp. 560-576. Richardson, The H.264 Advanced Video Compression Standard, John Wiley & Sons, May 2010. Further resources on H.264 and video compression here. I would like to thank Gary Sullivan for suggesting a treatment of the H.264 transform and quantization processes along these lines and for his helpful comments on earlier drafts of this document.